NSF International has launched a new certification program that provides third-party verification of consumer product claims asserting they can be safely disposed of via toilet flushing. Developed in response to the increasing number of flushability claims on many disposable consumer products, the new NSF Flushable Consumer Products Certification Program provides a solution to many clogging issues associated with wastewater treatment systems. The NSF Flushable Consumer Products Certification Program addresses consumer products making flushability claims, such as facial tissues, baby/cosmetic wipes, kitty litter, pet refuse bags, disposable diapers and feminine hygiene products. 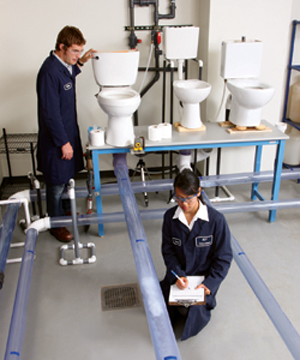 The comprehensive program evaluates products against rigorous flushability guidelines developed by industry experts called the “The Guidance Document on the Flushability of Nonwoven Consumer Products,” which provides a comprehensive framework and test methods for evaluating flushability characteristics. Manufacturers submit product information and samples to NSF. NSF tests product samples to ensure they meet the requirements of the guidance document. This testing is conducted using a flushability rig, custom-built to conduct the testing outlined in the Guidance Document, which includes various drainline slopes, toilets and pipe diameters used in both the US and European plumbing systems. NSF inspects the manufacturing facilities to verify that products are being manufactured to approved specifications and adhere to proper safety and quality checks. NSF certification is granted if all test and inspection requirements are successfully completed. Certified flushable products will bear the “NSF Certified Flushable” Mark, demonstrating compliance with NSF’s stringent criteria. The Mark indicates whether certified products are suitable for a sewer system, a septic system or both. Annual facility audits/inspections and periodic product testing are required to maintain a company’s active listing on NSF’s website and continued use of the NSF Mark. This NSF “Certified Flushable” Mark may also be used on product packaging and marketing materials. For more information, visit www.nsf.org/info/flushability. NSF International, an independent, not-for-profit organization, certifies products and writes standards for food, water and consumer goods to minimize adverse health effects and protect the environment. Founded in 1944, NSF is committed to protecting public health and safety worldwide and operates in more than 120 countries. NSF is a World Health Organization Collaborating Centre for Food and Water Safety and Indoor Environment. For more information, visit www.nsf.org. The NSF Flushable Consumer Products Certification Program provides companies with a credible means to substantiate flushability claims. NSF’s Wastewater Treatment Program offers certification to technologies, which treat whole house wastewater, black waste, graywater and individual treatment components, such as filters, pumps, etc. The wastewater program was developed at the request of the regulatory community more than 30 years ago when the alternative, on-site, residential wastewater treatment industry began to grow and the demand for effective on-site treatment increased. NSF’s Sustainable Business Services include product assurance, standards development and management systems registration. Additional services include NSF Education and Training, safety audits for the food and water industries, dietary and nutritional supplement certification and organic certification provided by QAI (Quality Assurance International).